Disliking a documentary because it sensationalizes the true story is about as dumb as disliking boxing because it’s violent. In both cases, you have the option not to watch and to judge with your back turned in protest. But you can’t voluntarily sit down in front of a style you don’t like and then criticize the product for doing what every other that has come before has already done. Basically, you only have yourself to blame if you watch guys getting punched in the face for an hour and then say you hate watching guys get punched in the face. Documentaries aren’t unbiased, they aren’t strictly news reports, they are skewed toward a certain point, and spend their time trying to make it. He Named Me Malala isn’t a perfect film and I didn’t love it, but I can’t critique it for making her out to be a bit more of a heroine/goddess than she might actually be, because, well, duh. Malala Yousafzai, the modern face of equal rights for women in the Greater Middle East. As a girl growing up in Pakistan, Malala had the unusual circumstance of being the daughter of a teacher & public speaker, a man dedicated to education of all people, regardless of gender or tradition. But when the Taliban moved into the area, Malala’s father’s opinions would become unpopular, even illegal, and very dangerous. His stance and her speeches at a young age made her a target for terrorism, ending with an attempt on her life on a bus on the way to school. Malala would survive, would refuse to give up, and would become the voice for girls everywhere who wanted an equal opportunity. Her courage in the face of overwhelming evil has inspired millions, and her determination to speak out has made her one of the most influential people of the young century. Of course a true story about a teenager who gives speeches on women rights, who was shot in the head by the Taliban, who survived, who received a Nobel Peace Prize, and who spoke in from of the United Nations will become a little sensationalized in the telling; how could it not? He Named Me Malala is a documentary on not just the events that happened, but on the power one person can have to change the world. It’s dramatic, perhaps shows her as more of a Mother Teresa than can actually be true, but the point is a simple one, and I don’t understand how cynical you’d have to be to dislike this movie on the grounds that, well, she isn’t that great. Other concerns perhaps? Because those might be more valid. 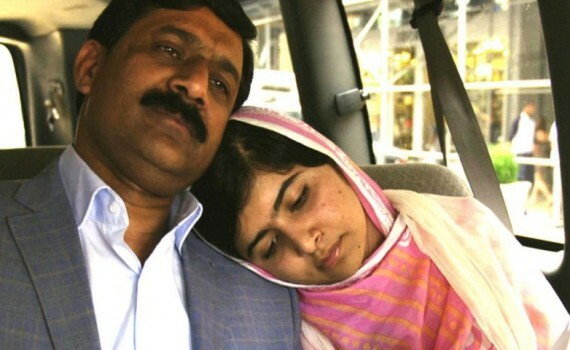 The film is very defensive about the idea of her father pushing her to be the person she is, even the title becoming a reference to her father naming her Malala (a legendary hero) but not forcing her to speak out. That creates a little doubt, and one could argue that this girl is a bit more of a pawn than a genius, but that would just sound bitter. A better argument against the film would be that the movie itself just isn’t that well-made, that the director makes the story more messy than concise. That’s how it struck me, a little amateur and relying very heavily on our already knowing all about this girl, rather that constructing a stirring documentary that we can’t help be swept away by. There were some really awful pace issues, there were moments when the art imbedded into the film felt very juvenile, and the film as a whole was trumped by the girl they tried so hard to idolize. Don’t count me as someone holding on to bitter or jealous thoughts, but I also can’t claim that I thought Malala was a tremendous movie when scrutinized.